This page was designed to offer spiritual resources for those who are really struggling from worry, stress, and illness. There always seems to be scary things happening in the world and pair that with the moral decay spreading throughout our society, and it can all get to be a bit overwhelming at times. This is why I believe it’s time to call in reinforcements. Someone to provide wisdom, guidance and intervention. In other words, it’s time call in the big guns by turning to God on a much larger scale. As a result I decided to do some research on apparitions. I found that a few of the popular places where Our Lady has appeared in person, offer online petitions along with the Western Wall in Jerusalem. So I thought I would pass the list along, just in case anyone might have need of it. For same reasons listed above, I recently found myself inspired (and strongly driven) to create a special rosary for the cause. I call it The Speziale Special Intention Rosary (SSIR for short). It is a new way of helping people organize their thoughts so they can ask God for help and intervention while still meditating on the Mysteries of the rosary. Kind of like a new organizational system for prayer. My hope is that it will help people process through the emotional stress and trauma of their daily lives while also giving them the ability to focus on some good stuff too. 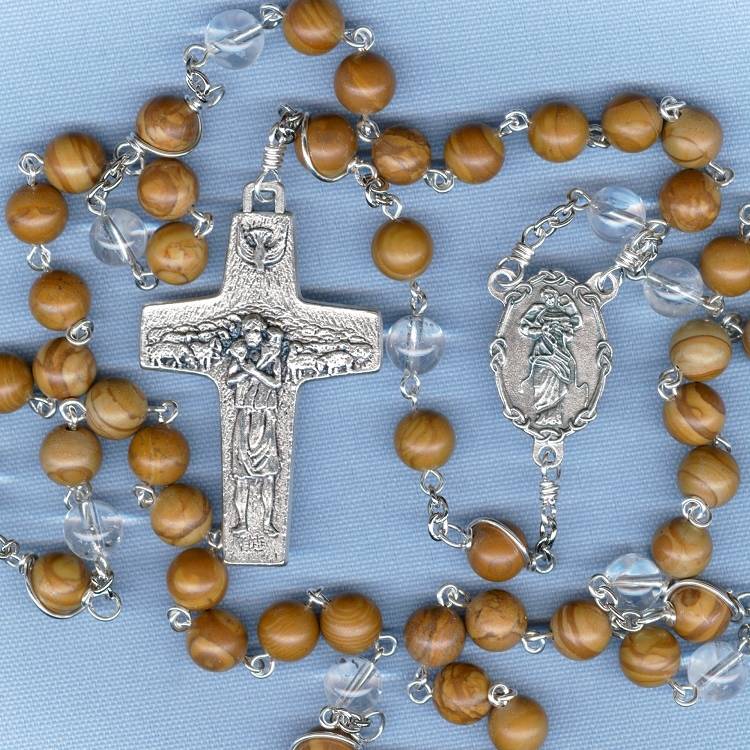 We all know that constant focus on overwhelming negativity isn't healthy for anyone, but hopefully this rosary will give people an opportunity to voice their fears, ask for help, and then recognize, and be grateful for, all of the wonderful blessings in their lives (even those we sometimes take for granted). For a printable version of The Speziale Special Intention Rosary please click HERE. 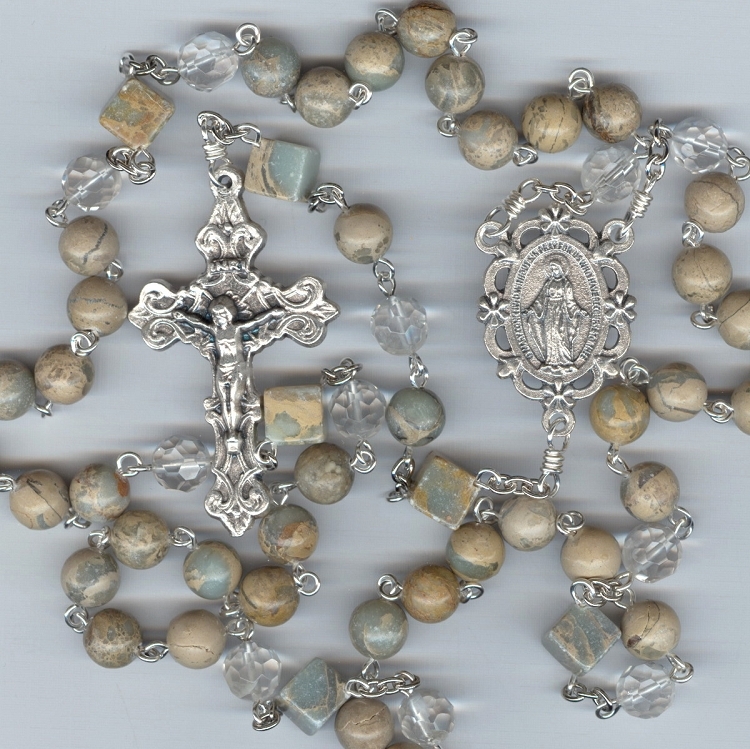 My Speziale Special Intention Rosary (SSIR) is used just like a traditional rosary but with a few small tweaks. I’ve added a new opening prayer called the “Prayer for Guidance, Wisdom and Hope”, 5 special intention beads, and 5 gratitude beads. Each decade will provide an opportunity to focus on a specific special intention while acknowledging and showing gratitude for the gifts God has already given. Prayer for Guidance, Wisdom and Hope (see below): On my SSIR the middle (or 2nd) Ave bead located between the center and the crucifix will be clear (or a different color). Some people refer to this bead as the “Hope” bead which is why I chose to make it part of my SSIR. Hope is such an important part of processing through life’s challenges. Without hope, many would give up entirely. This bead is where you add my new opening prayer (either before or after your Hail Mary) which includes some of the special intentions many people pray for every day. Special Intentions: Each decade will start with one clear (or different color) bead. This is the special intention bead. Before you say the 1st Our Father, simply give voice to your special intention. It could be something personal like job, health, or family issues. It could be something for a friend, or it could be for the benefit of the world in general. 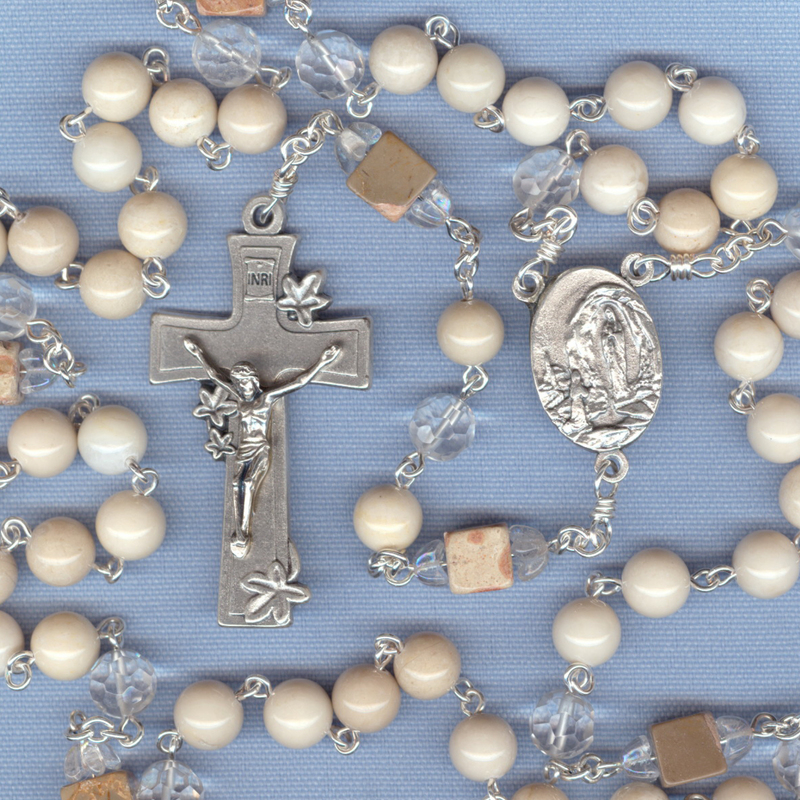 Since every decade begins with a special intention bead, you will have the opportunity to reserve a different special intention for each decade of the rosary which will help keep things from getting too overwhelming. Gratitude: The last bead of each decade will also be a clear (or different color) bead. This is the gratitude bead. After saying the last Our Father, it’s time to voice gratitude for the positive things in your life. Your blessings. You could thank God in advance for helping you with your initial intention or for past answered prayers. You could thank God for the gifts in your life that you find most meaningful (i.e. family, friends, job, food, home, certain life experiences that although challenging at the time, gave you an opportunity to learn valuable life lessons, etc). This is also a good opportunity to thank God for all the things you might be taking for granted every day. It’s the perfect time to open your heart, show your appreciation, and let God know how grateful you really are. My hope is that this rosary will become a way to renew our faith and optimism when facing life’s most difficult challenges. I hope that it can open our minds to God’s wisdom and encourage us to continue to ask for His (and The Virgin Mary’s) help, guidance and intervention while also shedding a bright light on the vast amount of blessings we already have. I believe that with the proper balance, the sometimes overwhelming darkness might not seem so dark anymore. Please knock on the door of ALL hearts, so that we may feel Your love and kindness. Please open and clear ALL minds, so that we may be willing to see, hear, and know you better. Please awaken ALL spirits so that we may learn how to love and accept others as You do. Fill us with the strength and fortitude to spread Your will through action, as well as word, free of any ego, pride, or arrogance. Bless us with the gift of self-awareness so that we may learn to avoid harmful behavior seeded by pride, low self-esteem, and ignorance. Lovingly bestow humility and courage so that we may face our weaknesses, failings and mistakes (as well as those of others) with grace, dignity and patience. Through your love and grace, O Lord, please teach us not to hate, judge, or stand in self-important tyranny over others, even when those around us say we should. Encourage us to see each other as we are: individuals, created by God and not just a group of nameless faces to be categorized, labeled, or mistreated according to the will of those who would divide us. And please bless all who believe in You, O God, regardless of religious denomination, so that we may be united in our love for You and open to learning love and tolerance for one another. My Lord Jesus, if we are unwilling to answer your call, please be patient. Please continue knocking in hopes that someday we might answer. Gently guide us in our decisions and interactions so that we may make You proud. By Your love and grace, may our faith be everlasting. May we always stand secure in knowing Your love for us. And may we always remember the precious Sacred Heart that you so lovingly sacrificed for ALL. All these things I humbly pray in the name of my most Blessed Lord Jesus Christ, my Mighty God, and my Ever-present Holy Spirit upon whom I can rely.